Cross training shoes are becoming increasingly more common in strength sports. These are shoes designed to feel like flexible tennis shoes, but with a strength athlete in mind. This being said, they’re constructed slightly different than your standard sneaker. A few of these features include stiffer soles, additional heel support, and flexible/durable construction. Reebok is now in their eighth iteration of the Reebok CrossFit® Nano, but how does it compare to the market’s best cross training shoes? 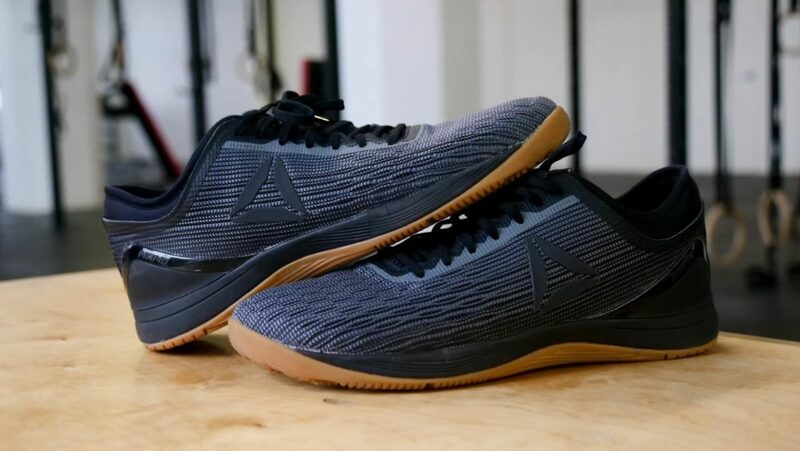 In this article, we’re going to take a deep dive look at the Reebok CrossFit Nano 8 Flexweave, and assess how they performed in the gym. We’ll break down the Nano 8’s construction, functionality, shoe material, stability, and price. The eigth version of Reebok's Nano model that offers a strong plastic heel cup, 4mm heel-to-toe offset, and Flexweave construction. Not sold on the Reebok Nano 8 Flexweave? Check out comprehensive list of the best cross training shoes on the market! To kick off the review, the Reebok CrossFit Nano 8 Flexweave has a couple standout features that make it different from previous models. The first difference is the new bootie construction this shoe offers. Unlike past models, this shoe has a separate bootie, which is completely independent of the outer shoe material. This was an interesting change, and I’m not going to lie, I was skeptical at first. Things I liked about the bootie was its flexibility and comfort. These shoes never feel limiting in movements, and you can even wear them barefoot with comfort. The only potential issue I could see with this separate bootie is possible instances where it comes loose. There’s a connective piece between the booties and the shoe’s heel, and if that ever snapped, then you may run into a problem. Shop the Reebok CrossFit Nano 8 Flexweave and browse colors HERE. 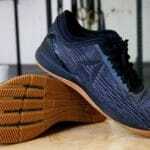 Another feature this shoe offers is the flexweave material. 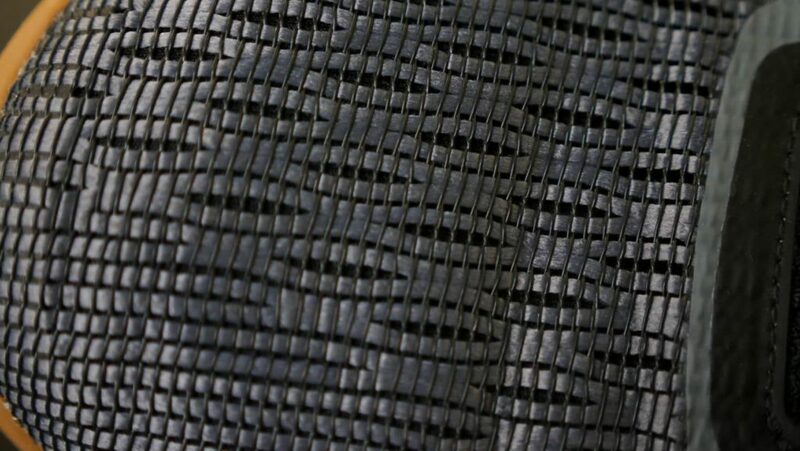 This material feels a bit rougher than previous models and has a cross-weave design to it. I was a fan of this material for three reasons. First, it’s very breathable. Second, it has a fair amount of flexibility to it. Lastly, it feels durable and was pretty resilient to rope climbs that can sometimes cause shoes to fray. Conversely, I could see someone not liking how the material sits independent of the bootie and may feel it to be too loose. 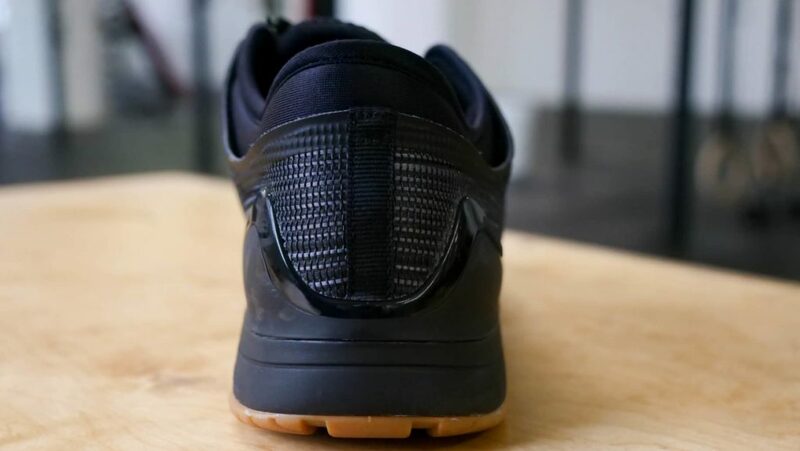 The final features worth mentioning on this shoe are the toe box, heel cup, sole, bottom design. This Nano’s toe box is slightly wider than previous models, and I liked that for specific reasons, which I’ll explain in more depth below. 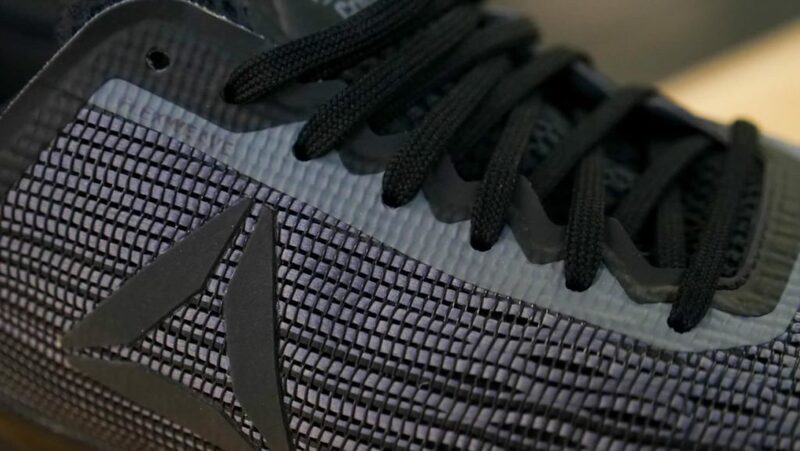 There’s the plastic heel cup that is similar to what the Nano 7 offered. The sole is pretty hard and provided a solid base in multiple movements. 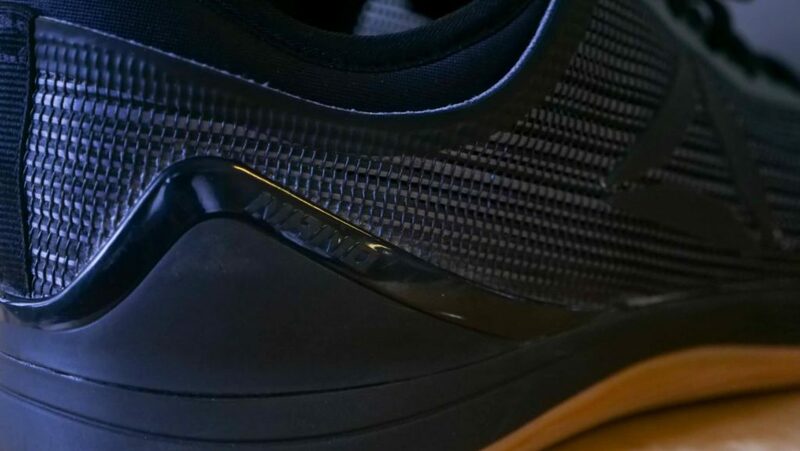 Lastly, the bottom of sole has a wave-like material and that provided grip on multiple surfaces. For functionality, I performed five calculated tests with these shoes to assess how they performed. These movements included a back squats, power cleans, rope climbs, box jumps, and wall balls. Granted, I wore them in my day-to-day activities, these five tests were my scalable exercises. I liked how the shoe felt in the back squat and power clean for two main reasons. First, the sole was hard and didn’t have any give to it. I felt confident sitting back in cleans and coming out of the hole in the squat. Also, I felt like the heel cup provided a little extra support, which is a nice add on. The second reason I liked these shoes in the back squat and power clean is for the wider toe box. Personally, I splay my toes pretty wide in both movements (aka spread them to grip the floor), so having a wider toe box is always a positive in my eyes. I’m not a fan of narrow shoes because I feel off balanced in them at times. For rope climbs, I liked how the Flexweave accepted the rope and showed no early signs of wear and tear. My final two tests were the box jump and wall ball. I tested the box jump to assess the sole’s comfort on impact, then the wall ball for mid-foot flexibility. 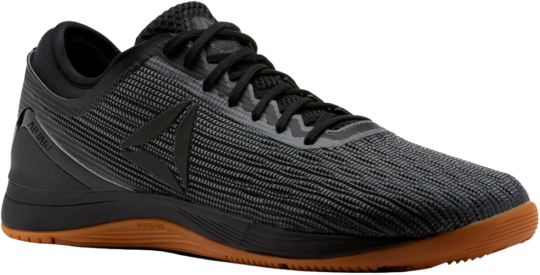 As mentioned above, the sole is pretty hard, so it wasn’t the comfiest cross training shoe I’ve used for repetitive impact movements, but that probably won’t bother most people. For wall balls, I liked this shoe’s ability to easily flex when hitting ankle extension. It didn’t feel stiff whatsoever, so flexibility was never a concern, even during the “breaking in” period. We talked about it above, but the Nano 8 is composed of Reebok’s Flexweave material. This material is said to be composed with Reebok’s open figure-8 construction. They state Flexweave can interlock unlimited amounts of fiber that interlock to create a durable material. The material itself doesn’t have much stretch to it, which I thought was good sign for the shoe’s long-term longevity. In addition, the material is really breathable and you can even see there’s some room for air in-between the Flexweave and the bootie itself. If you’re prone to stinky feet, then I’d feel confident saying this shoe’s material will do a pretty good job at helping you out. Also, the Flexweave felt durable on things like rope climbs, which can cause early wear and tear due to friction. I can see this shoe’s stability being a total hit for most, but a miss for some. In regards to being a hit, this shoe has a few stability aspects going for it. First, the sole is hard and doesn’t give under weight. In fact, I thought it was almost uncomfortable to perform cardio-based movements in. I took my dog for a few jogs in these shoes and found my feet making pretty heavy foot strikes. Although, you have to keep in mind, these shoes aren’t designed for running, and this was just an observation. Second, the additional heel cup was a nice touch for stability. It provided a slight feeling of being “locked in” when sitting back during certain movements, or performing lateral work. Third, the shoelace eyelets are subtle benefit to this shoe’s stability. There are seven eyelets, so you can lace the shoe up pretty high. For some athletes, this can provide a bit more stability towards the top of the ankle. Now for the potential miss. If you’re an athlete who wants a shoe that feels incredibly stiff and tight, then you may have issue with this Nano. I could see the slightly wider toe box and flexible construction causing issues for someone with exceptionally skinny feet wanting a shoe that feels narrow. But like I said, for many, this won’t be an issue, yet it’s definitely something to consider when purchasing. For the Reebok CrossFit Nano 8 Flexweave you can expect to pay $130.00. This price is pretty standard for newer versions of cross training shoes, so it shouldn’t catch many by surprise, especially those who’ve bought Nanos before. Of course, you could find cheaper older models, but if you’re interested in the new features of this model, then I think the price is pretty fair. All in all, I was a fan of this Nano model. For context, I was not a big fan of the Reebok CrossFit Nano 7, but this model has restored my faith in the Nano line-up. I enjoyed the newly constructed separate bootie and wider toe box. Personally, I found both of these features to enhance my performance, as opposed to just acting as another cross training shoe. The only issue I could see athletes having with this model is how flexible it is, but that’s going to come down to personal shoe preference. 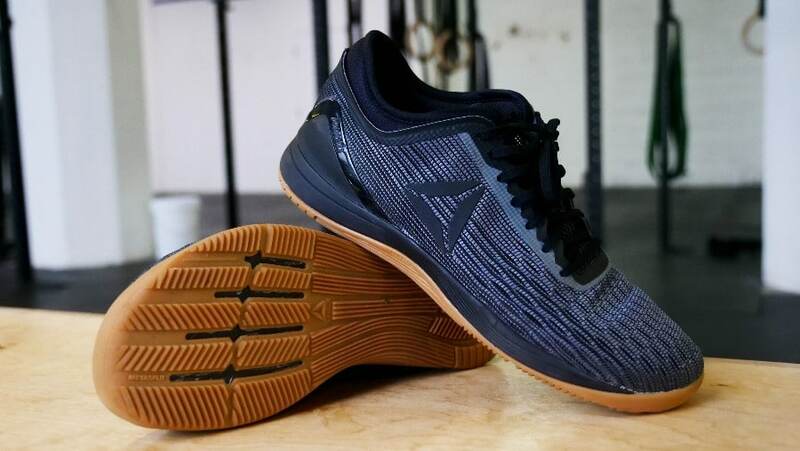 If you’re looking for a comfortable and flexible cross training shoe, then I think the Reebok CrossFit Nano 8 Flexweave could be good option for you. I measured my feet according to the instructions and the measurement is 26 cm (10,2 inches) which corresponds to a size 6.5 UK according to the Reebok size chart. But I have Adidas trainers and running shoes which both have a 26 cm insole, and .. fit totally different. 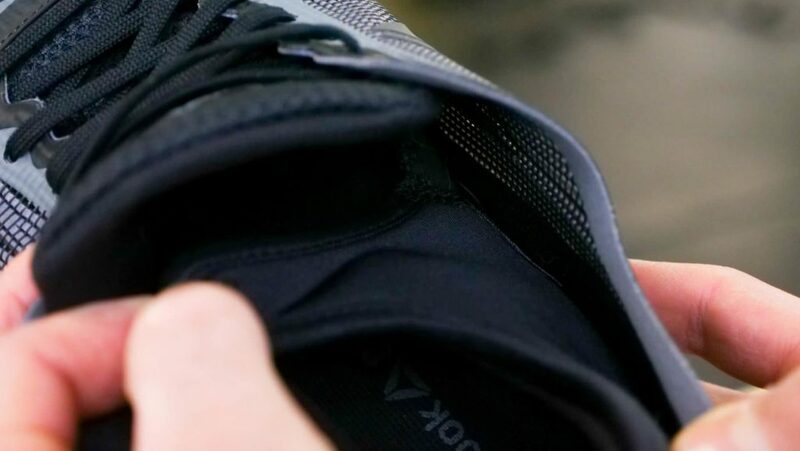 The trainers are too tight from the toe (size 7 UK) while the running shoes fit well as these have curved insole in the heel which gives some extra room. 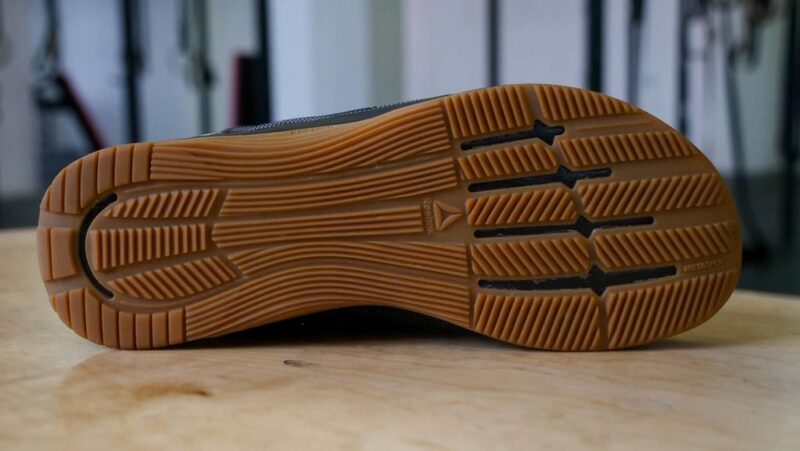 So the insole is actually more like 27 cm long if the curved part is taken into account versus the trainers which go straight up where the insole meets the heel. So, according the the foot measurement the Adidas trainers should have been at least 8.5 UK (which is 42.5 in EU size :O) amd I didn’t k ow that at the time. Size 7 UK is translated as ca size 40 both in Reebok and in Adidas shoes. And my casual trainers and high heels come in EU sizes 39/40, UK 6.5 (to compare, then Ecco, Peter Kaiser and Hispanitas shoes). That’s why I thought the Adidas 7 (EU 40,5 according to their’s would be safe bet, but wasn’t). Adidas’s and Reebok’s size charts are really different it seems and Reebok seems to correspond with other brands I wear more than Adidas. PS – please do not publish the e-mail.